When I first entered the dating scene I never thought I would be able to handle a long distance relationship. It wasn’t something I wanted and it wasn’t something I ever thought I would need to do. All that changed when I got together with my now Husband, Jake. Jake and I met back in high school. I was a freshman and he was a senior. We dated for about two weeks then decided we were better as friends. Not long after he left to join the Marine Corps and we lost touch for SIX years. Fast forward those six years. I write a heartbroken facebook status because I had just ended a 3 year relationship with someone I seriously thought I was going to marry. At the same time Jake had just ended a serious relationship too. We were both in a sad place and Jake reached out to me to tell me I was going to be ok and he was there if I needed someone to talk to. Facebook messages led to texting which led to Skyping, which led to me flying from MN to CA to see him which was when he officially asked me to be his girlfriend as we walked along the beach hand in hand. Six months later he asked me to marry him on the same beach. Two months after that he deployed to Afghanistan for 6 months and I was still in MN working, finishing my Bachelor’s degree, and trying my hardest to keep our relationship alive. The number one thing to focus on during a long distance relationship is COMMUNICATION! Things were a lot easier communication wise when Jake was not deployed. In the beginning of our relationship we Skyped just about every night as we battled each other on Words With Friends. We texted throughout the day and everything was going really well. It wasn’t the same as seeing each other, hanging out, going on dates, etc but it was all we had so we tried to make the most of what we had. During his deployment things were a lot harder. I stuck to letters, Facebook chatting, the rare Skype session when he had good enough internet connection, and e-mails. E-mails like this one gave me the strength to fight through the loneliness and hang on to the love we had. TRUST is next in line when it comes to keeping the love going during a long distance relationship. I have to admit this was something I really struggled with and still do. I had my heart broken and trusting another man so quickly was a struggle. Especially when he lived so far away and I didn’t know what he was doing or who his friends were. All I had to go off of was what I knew about his past which wasn’t filled with the most pleasant things. I had to learn to put that aside and realize that people can grow up, people can change, and that it was possible that this man really loved me and wanted to spend the rest of his life with ME. Not his ex girlfriends. ME. Quiet, shy, socially awkward, nerdy ME. Keeping things FUN helped us stay connected as well. We played games together over X-BOX live, we told each other lame jokes, and we innocently teased one another. While he was deployed I sent him care packages, letters of encouragement, and daily e-mails. 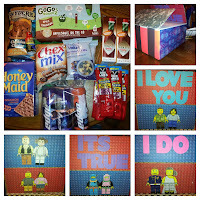 He mostly looked forward to the care packages and I must admit I made some really FUN ones! 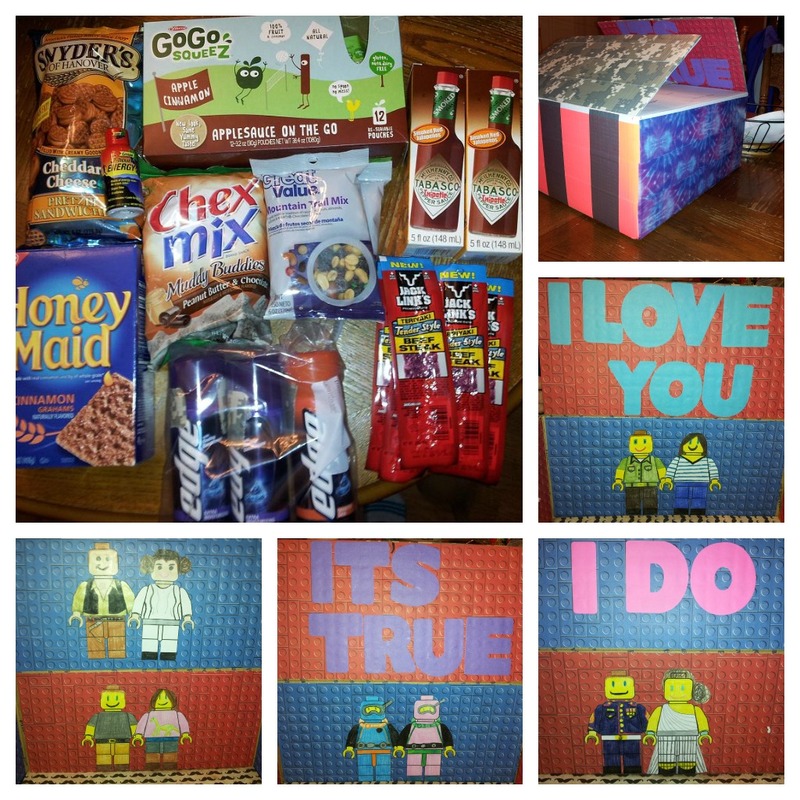 His favorite was this LEGO themed box! Not letting JEALOUSY overcome you is also key. He will be hanging out with his friends. He will be out doing fun things without you and that’s something you have to learn to accept while you are apart. You just have to keep in mind that you will get your chance and when you do it will be that much more special and rewarding because it isn’t something you get to do often. You grow to appreciate one another on a whole new level and the little things other relationships take for granite are things you cherish and hold onto. 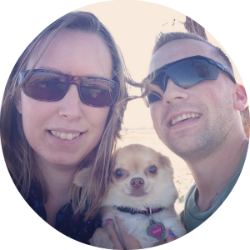 My Husband and I went through 1.5 years apart before we finally got married in March 2013, and I moved to CA in May 2013. We love doing things together, we love building a home together, and we love that distance is not an obstacle for us at this moment. Since Jake is in the military we know another deployment is bound to happen, trainings and schooling will also come up. However, we know that we can make it through these times apart because we have done it before and we have learned tips and tricks to stay connected when distance separated us. If you are going through a long distance relationship hang in there! It will all be worth it in the end and you can do it! This post was contributed by Miranda at Hurry Up and Wait. I’m Miranda, a small town MN gal living in the big city of sunny San Diego! 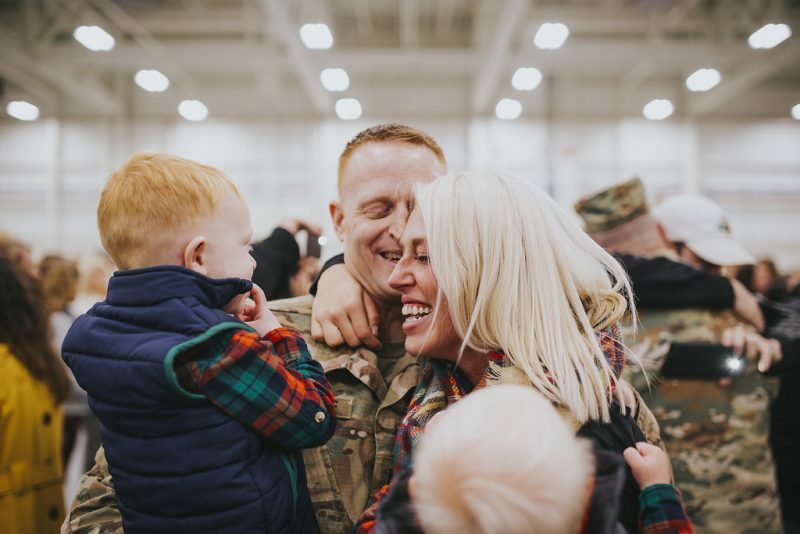 Happily married to a military man and a proud momma of two fur-babies. Follow me as I embark on life’s greatest journey as a college grad and Marine Wife! If you enjoyed this post and would like to read more about me please visit my blog Hurry Up and Wait.